Simon's experience is still one of profound privilege compared to the stories of many LGBT youth today. While Simon came out to an affirming family, the national average is that 40 percent of homeless youth are LGBT due to familial homophobia and transphobia. And while Simon was anxiously counting down the days until graduation, LGBT youth experience a dropout rate nearly three times the national average. Remember that Simon's teacher stood up for him when he was bullied, but that many LGBT youth lack adult advocates in school. 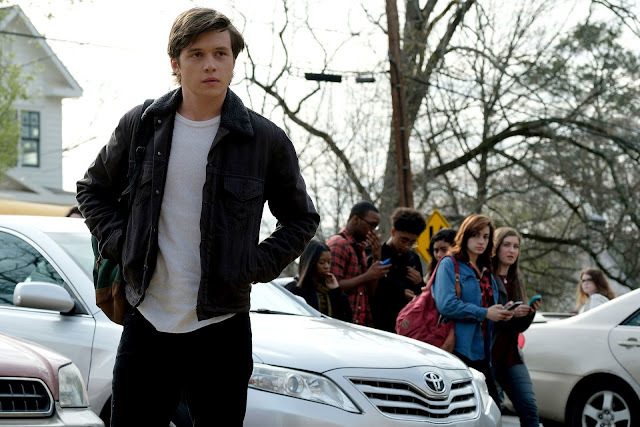 Remember that while Simon had the Hollywood happy ending we all paid for in our admission to the theater, this is not always so for LGBT youth in our society. Though teaching LGBT history is proven to help eradicate bullying and harassment in school toward LGBT students, few schools include it in their curriculum. And transgender students across the country lack assurance of their basic right to public accommodation in school due to the Trump administration's rescinding of the Obama-era Title IX guidance. When I first heard about this film (opening here today) I had that yawning feeling - 'So yesterday!' But it's been getting good, though non-exceptional, reviews, despite reservations about its unrealistic cosiness of everything working out fine. I'll be seeing it, without any towering expectation. I did see the film and liked it very much. It is very sweet. Obviously, things are better than they used to be for LGBTQ youth, but not for all. It's just like the film "Call me by your name" Yawn. and Yawn to this also. Oh dear (Re: Joe B's comment)! I quite liked 'Call Me' but not as much as a lot of people, my own stress being on the 'Quite'. I was hoping 'Simon' would be rather better than that. Probably now going on Sun.